There are 5 species in the plant genus Strelitzia, native to South Africa. They are called Bird of Paradise because of their resemblance to an exotic tropical bird. South Africans call it the Crane Flower because it resembles the head of a crane. 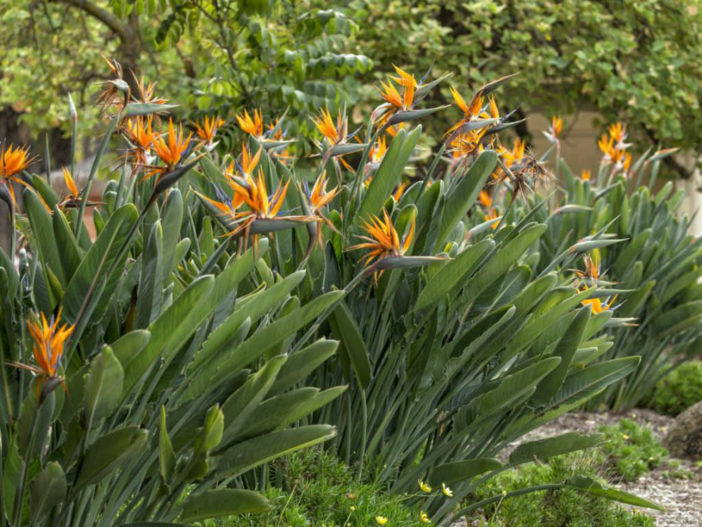 Bird of Paradise grows in a trunk-less clump of stiff, green leaves that limit the potential of training through pruning. Because it grows in a clump, not with a trunk and branches, there is only so much you can do by way of pruning to manage the size of a Bird of Paradise. Your best option is to carefully select the most appropriate species for your space. The common Bird of Paradise (Strelitzia reginae) grows up to 6.6 feet (2 m) high and up to 3 feet (90 cm) wide. The largest species, Strelitzia nicolai, grows up to 20 feet (6 m) tall. The white Bird of Paradise, Strelitzia alba, is a tree-like plant that can reach up to 33 feet (10 m) tall and is not suitable for a small garden. The slow-growing Strelitzia juncea grows up to 6 feet (1.8 m) tall and has leaves that disappear over time, giving the plant appearance of a waterside reed or rush. If you want to limit the height of a Bird of Paradise, you can selectively prune its taller leaves and stalks when it is dormant in the winter.